CEI’s Graduate Fellowship Program provides UW students the opportunity to help shape the clean energy future of the Pacific Northwest and the global energy economy by advancing next generation solar energy and electrical energy storage materials, devices and systems. 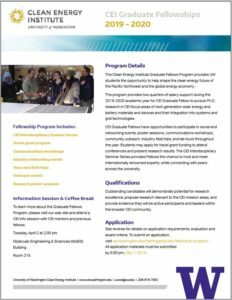 The program provides two quarters of salary support during the 2019-2020 academic year, and the designation as a CEI Graduate Fellow to pursue Ph.D. research in CEI focus areas of solar energy conversion, energy storage, and grid integration technologies. Students may also apply for travel grant funding to attend conferences and present research results. Through the Institute, Graduate Fellows have opportunities to participate in social and networking events, poster sessions, communications workshops, volunteer opportunities and community outreach, industry field trips, and lab tours throughout the year. The CEI Interdisciplinary Seminar Series provides Fellows the chance to host and meet internationally renowned experts, while connecting with peers across the university. The CEI funded students from departments across the UW, including Chemistry, Chemical Engineering, Electrical Engineering, Mechanical Engineering, Materials Science and Engineering, and Physics. Applications for the 2019-2020 academic year are now open and will close on May 1, 2019.